In April 1947 the small aircraft company Chrislea, relocated to a site at Honiton Clyst near Exeter Airport, due to the aerodrome at Heston being closed. The company was formed on 2 October 1936 to build aircraft designed by Richard Christoforides. The name Chrislea was an amalgam of the partners Christoforides and R.V. Leak. In February 1948, Chrislea, rolled out the first of a new type of aircraft. There were two models, one being the Super Ace and the other was the Skyjeep. In August 1949, the Secretary of State for Air, Mr Arthur Henderson attended an airshow at the airport, at which the Super Ace was one of the exhibits. 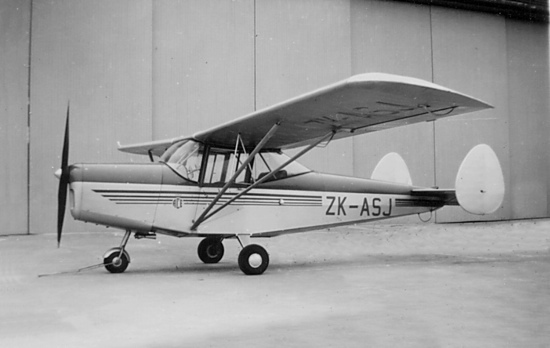 The Series 2 Super Ace, powered by a Gipsy Moth Major 10 piston engine, first flew at Exeter in February 1948. By December 1949, the Series 4 Super Ace was being promoted as an air ambulance at a selling cost of £2,250. It had a cruising speed of 110 mph and a maximum speed of 130 mph, with a range of 520 miles on 39 gallons of petrol. It could take off into a 5mph head wind within 150 yards. They did not sell well, partly due to the unconventional control wheel, and Richard Christoforides left the company. Only eighteen Super Aces, out of a planned 32, were actually completed. 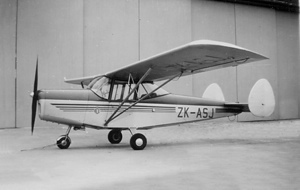 The Skyjeep, a variant of the Super Ace, but with a conventional control system, first flew in August 1949. Only three of the 155 hp Blackburn Cirrus Major 3 engine powered machines were built and sold to customers in Uruguay, Indochina and Australia. The C E Harper Aircraft Company took over Chrislea in 1952, and eventually evolved into the Exeter Aircraft Company, which would manufacture parts for the Vickers Armstrong Viscount, VC10 and other aircraft types. In July 1952, along with Garton and King, the Harper Aircraft Company exhibited the Super Ace at the Royal Show, near Newton Abbot. 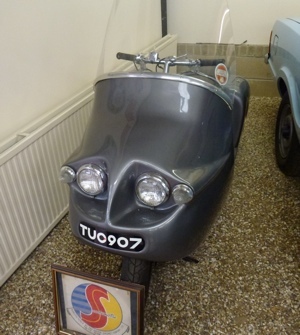 The Harper Aircraft Company of Exeter branched out into manufacturing motor scooters when in 1954 at the London Earls Court Show they introduced the Harper Scootermobile. Developed from an earlier machine called the Saharan, after its designer ‘Spike’ Rhiando test drove it across the Sahara desert in a journey to Cape Town. The machine was a glass-fibres, streamlined scooter powered by an electric started, Villiers 122cc engine. Six machine were built in total, and one survives, at the Hayes Museum in Somerset. The weight of the deluxe version was 300lb, while the standard, without electric starter was 245lb. Sources: Wikipedia, the Western Times, the Advertiser (Adelaide) and britishscooters.com. A Super Ace. Photo Courtesy of Ed Coates Collection The Harper Scootermobile. Photo Courtesy of John Southall.